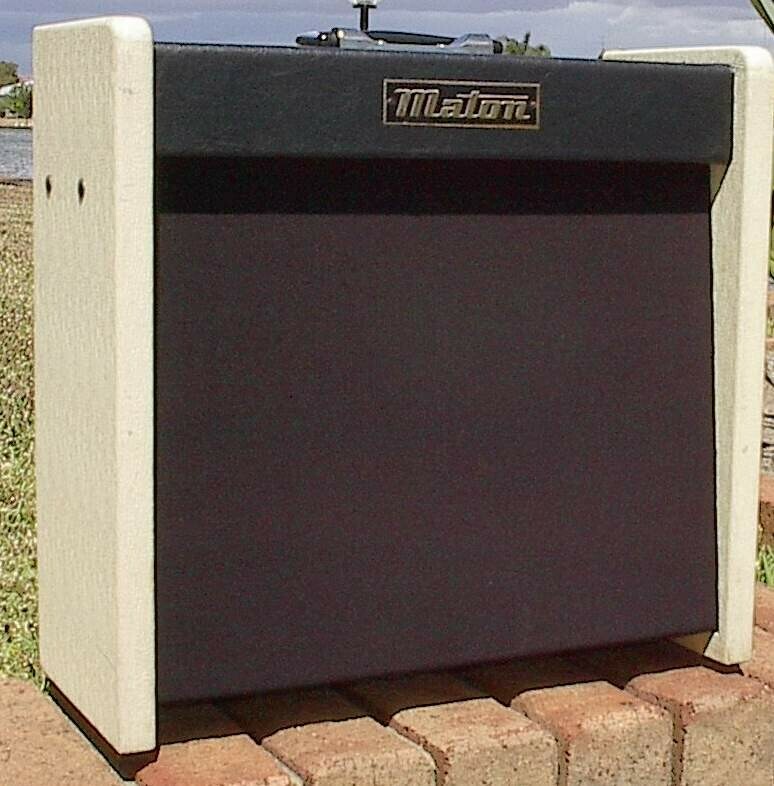 A beautiful sounding all-Australian Maton amplifyer. 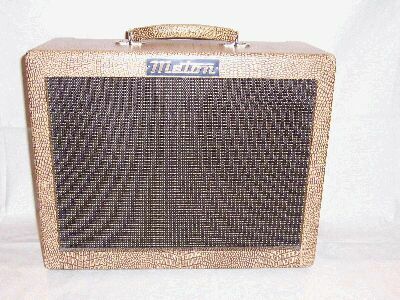 Maton no longer make amplifyers, so they are all highly sought after by collectors all over the world. Maton are known for their world-class Acoustic guitars. It's got 2 large and two small valves/ tubes. The large valves are 6DQ5As or 6DQ5Bs [*] which would put it at about 40-50 watts. The small ones are 12AX7's, and one is for the preamp. I'm told by an experienced ebayer that the valves are the type used in Moodys, Goldentones, Rose Morris amps and several other Australian types like kit-built playmasters. They are very rugged sweep tubes used to dive TV sets. It has two channels, and the head sits on top of the cabinet. There's a switch on the head that says “Sound Divider” 50 x 50, or, if switched down, it says 100. There's an on/off switch, with a broken glass cover over the “on” led light. There's a high gain and a low gain input titled “Bass instruments”. There's two other inputs for normal instruments, I assume, titled “Instruments”. There are 2 channels, both with volume, treble, base. They are all original knobs. On the back is two speaker jacks. One is untitled, and I don't know what it does, and the other is titled “Ex. 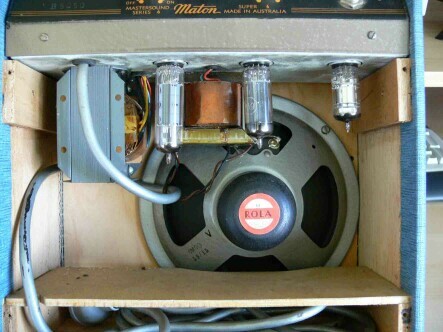 Speaker” There is a fuse knob, and a stand-by switch for the valves. 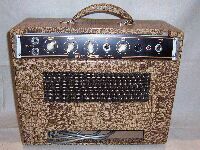 1G1 is etched into the back of the amp. 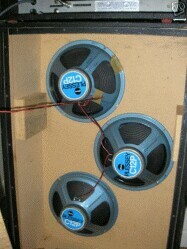 The cabinet has three 12 inch speakers that say Plessey C12P. 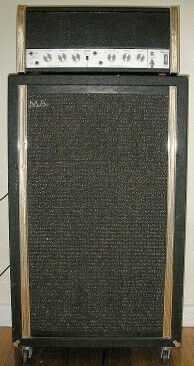 The three speakers (around 20 watts each) make the cabinet a 40-50 watt cabinet. 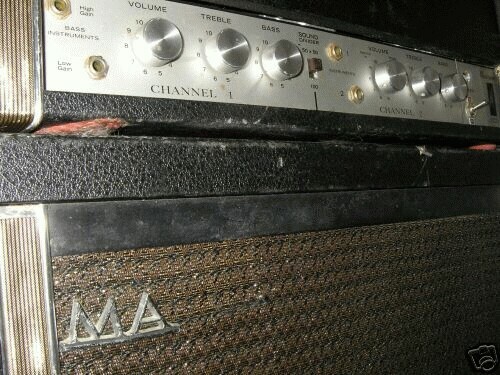 The amp is not in fantastic condition. It works fine, but it needs to be restored by a professional. 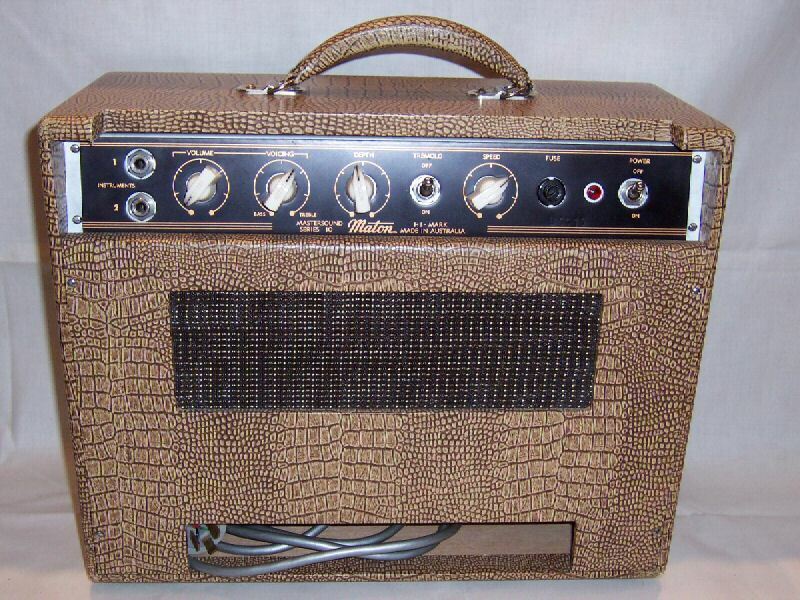 Although it's not in pristine condition, the amp sounds absolutely incredible. 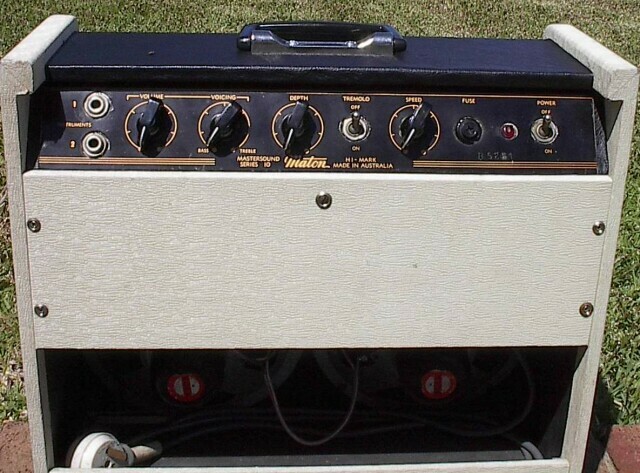 Like with all old-school valve amps, when you turn it up, it sounds warm and crunchy. When I play my FX pedal through it, the searing leads are just incredible. 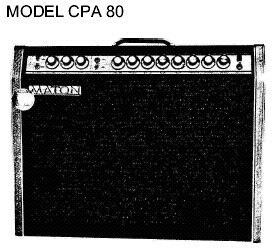 Similarly, if you plug a nice acoustic into it, it sounds priceless. Note: thanks to Ric's considerable efforts this drawing corrects a number of details on the original (undated). If you have the previous undated version please download this corrected version and delete the old one. 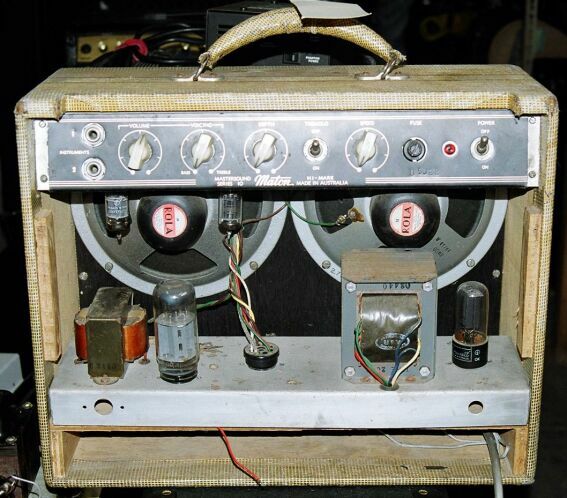 In Ric's amp the cathode resistor for V3A (tremolo injection) was 8k2. This was clearly wrong, biassing the preamp section V2A off. Reducing this to 1k has restored proper operation, but until someone else has a look under their Mastersound-10 and tells us what the correct value is, it remains a mystery. 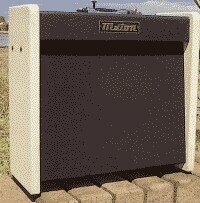 I just love the look of this amp. Power chassis underside (141kb jpg) is quite spare as most of the circuitry is in the preamps chassis. Caution: the 6V4 rectifier and 6GW8 output valves appear to be transposed in this shot. Castors and imported speakers optional. Maton were, and still are, mainly guitar builders. Out of the ordinary, this fretless lap steel has three fittings for screw-on legs, under. Asking AU$699 Sept '05.